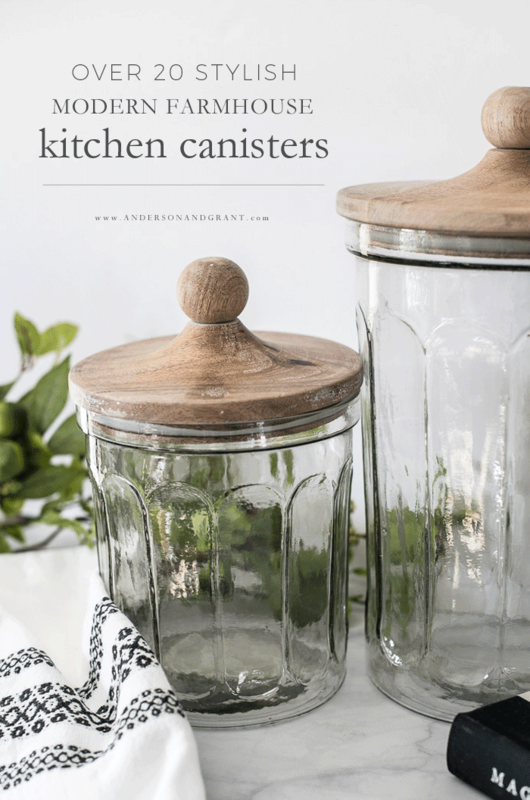 Sharing my new modern farmhouse kitchen canisters along with twenty other pretty versions to decorate your kitchen counters in your own home. A few months ago, I stopped by one of my favorite local shops and fell in love with a set of kitchen canisters displayed for sale. They were one of those things that you know you better leave the store with or you'll always regret it. The handcrafted shaped glass and "driftwood" like wood lids were something I hadn't seen anywhere else. 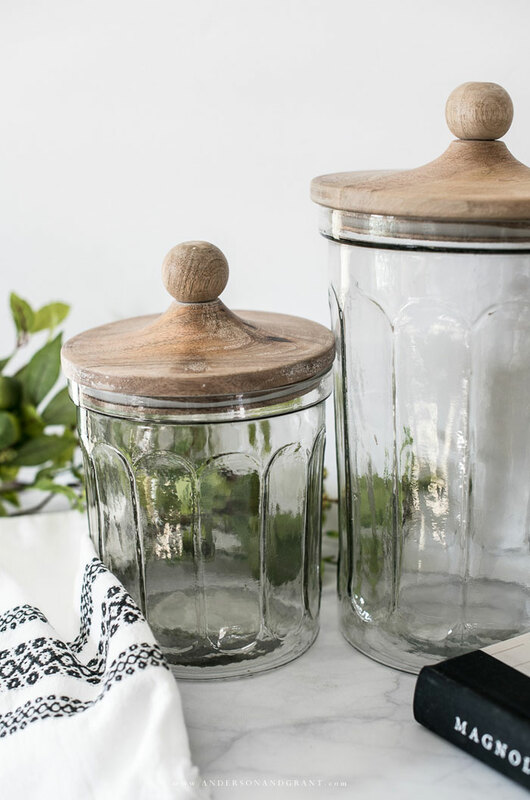 Even though my fixer upper kitchen renovation is no where near even being started yet, I knew that that canisters will fit in perfectly with whatever I decide to do. I'm a big believer in buying what really speaks to you when you find it. In my head, I'm picturing them in my kitchen with white painted cupboards and concrete countertops with a rustic work table island in the center. Can you see it, too? All lined up and filled with sugar and flour? But like I said, it's going to be awhile before that vision comes together. 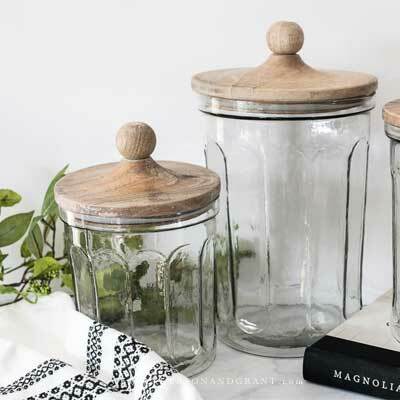 Since I wanted to share my find with you I went in search of where else might be selling these same canisters in case you wanted a set and found just one place and then they sold out before I got the post live. But low and behold after enough searching, I did find the Napa Home and Garden kitchen canisters being sold on everyone's favorite "store," Amazon. You better hurry if you want a set, though. 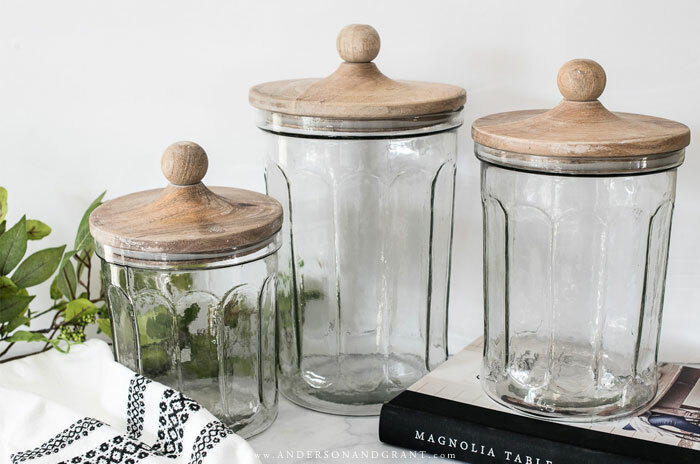 In case you these aren't your style, I've gathered together about 20 other kitchen canisters options that you'll love seeing "decorate" your kitchen counters. Are any of these your favorite?